(Newser) – Democrats are launching attack ads aimed at Republican Senate primary candidates—but the ads may actually be designed to get the easiest target nominated, insiders in both parties say. The apparent strategy follows Harry Reid's 2010 work in support of Republican Sharron Angle, who won her primary before losing to Reid. The AP cites Democratic ad campaigns in Missouri and Wisconsin that "selectively attack" GOP primary hopefuls. Missouri Sen. Claire McCaskill "is trying to pick the winner of the GOP primary," says a rep for one. Next on Newser: Working Late in Pregnancy as Dangerous as Smoking? Hence the need to end the political party system. Strategies to defeat opposing parties rather than clear and honest messages to get elected. It's shameful. 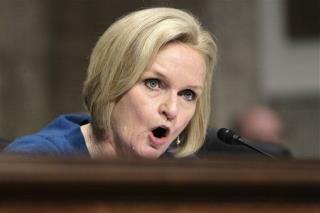 Other than the Kool-Aid Gang I don't believe anyone in Missouri is listening to McCaskill, what a twit. She needs to learn to pay her property taxes on her plane before she has the right to point fingers. I am sure her and Dooley had a game up their sleeves.